Change, it’s often said, is a good thing and we hope that the changes we have made around the place are indeed, good. The biggest change that you’ll notice is … well … EVERYTHING! 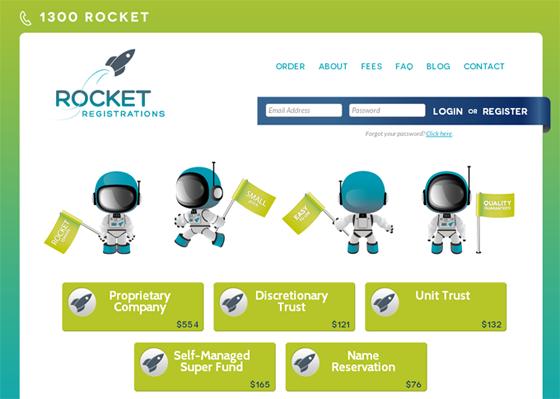 No stone was left unturned when it came to the rebranding of Rocket Registrations. Everything from the logo to the copyright notice in the footer of our website was reviewed and overhauled. One of the things that hasn’t changed is how easy it is to complete our order forms. The same intuitive forms are there as before, albeit looking slightly different (we like to think better). The other (most important) thing that hasn’t changed is the fact that your companies are formed correctly and are turned around quickly. Rebranding gave us the opportunity to come out strong with our social media presence and this blog. Now our website, blog and wider social presence will all work in tandem to provide a unified, streamlined experience of the whole Rocket business. If you ever need any help with an order or have any questions, you now have more avenues to get in touch with us, be it via a chat on the phone, sending an email or posting your question on Twitter or Facebook and getting a quick response back. Further down the track, we’ll be adding a ‘live chat’ function to our website, which will be manned each day by our staff. As you can tell, we’re all very excited to have re-launched our brand and are now able to serve your needs in new and exciting ways! We’d love to hear your thoughts on our new look and invite you to leave a comment below or come over to our Facebook, Twitter, Google+ or LinkedIn pages and say hello!